Focusing our Teaching and Learning Priorities: A reading list. This post is essentially a copy of a message I’ve given to my staff, collecting some required reading to inform the next phase of the development of our curriculum and our approach to teaching and learning. Hopefully you will recognise the Trivium in this; these ideas are ways of making things happen more deliberately and explicitly so that the conceptual ideas become more tangible and feature in the experience of HGS students every day. Our first run at devising a Highbury Grove model for Teaching and Learning last year captured lots of ideas but, now, we need to focus on fewer specific areas to make sure the default practice has shifted fundamentally; that the experience of every student is shaped more deliberately and consistently by all of us. 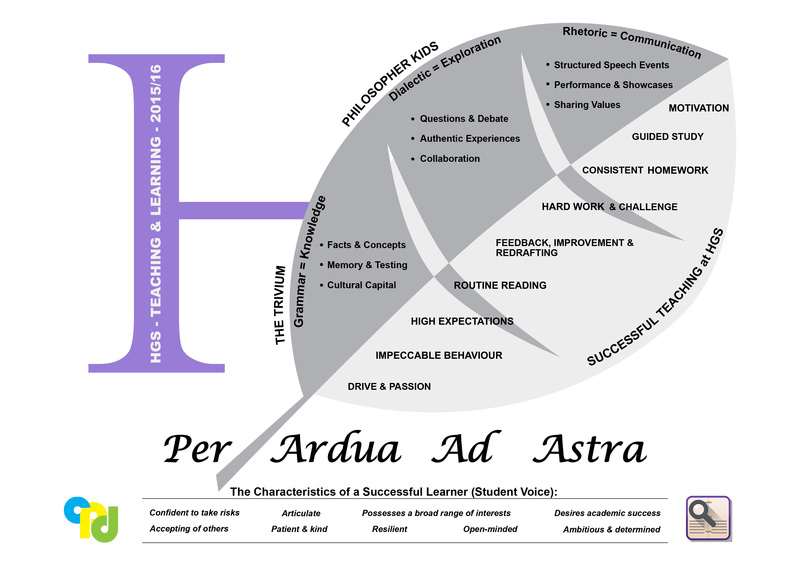 Our Teaching and Learning framework. Take One is packed with things to work on – now we need to focus on fewer specifics. Knowledge. Explicitly defined and taught. Reading. A daily diet of planned reading. Too many students don’t experience routine reading as a daily experience across the curriculum. That needs to change but it needs planning. What resources will you need to embed reading as a routine element of your teaching in order to contribute? It gives an idea of the strategies that surround reading in class and includes links to further reading about reading. Rhetoric. Embedding the roadmap; oracy as pedagogy. We will also build up the range of set-piece events like the forthcoming Year 8 Soapbox event, where all Year 8s make a 2-3 minute speech. And here is a superb blog from Jo Facer who attended our most recent TeachMeet. This approach to feedback looks very interesting – scanning a set of books for the issues, giving whole-class feedback and focusing on improvement in a very timely and time-efficient manner. It’s not marking as we know it. Excellence Exhibitions. One piece per subject per year, drafted, crafted and made beautiful. Here is Debra Kidd writing about her visit to School 21: https://debrakidd.wordpress.com/2016/02/05/beautiful-work-beautifully-done/. School 21 is built around this process – but we can develop the idea in our own way starting at a workable scale and building up depending on how things go. To make it workable, the idea is to map out a structure of units of work or extended projects that yield high value, high quality work involving multiple drafts until the work is exceptional for all students relative to their starting points. Once per year, per subject we go BIG on this and then display all the work to make everyone feel good about school, about learning, about what is possible. This could start as a KS3 thing only – unless people feel it could work at KS4/5 too. Assignments: With these ideas in mind, the nature and purpose of assignments can be made much simpler and easier to manage. We need to give students a guide to their learning: the things they need to know; the main products they’ll be producing and the main assessments. We could link to knowledge organisers – giving the headlines, highlighting key rhetoric components, identifying the one key task/product and the one key assessment. I’ll be asking curriculum leaders to discuss this with me and each other over the course of the summer term. Rewards, Catch-Up and intervention: We do a lot in this area but I don’t think we’ve got it right yet. I’ll be asking the new Heads of School, AHTs and Directors of Studies to work with HoDs over the summer term to review and re-think our processes here so that, from Autumn Year 7 onwards we have a more coherent whole school system that rewards achievement and picks up students who fall behind, who don’t manage homework or miss key assessments. Intervention needs to be targeted so as not to become unwieldy but, at the same time, we need a mechanism that tackles fundamental learning habits more intensively as soon as issues emerge. It needs to be as much carrot as stick. There are more things – but then we’d lose focus. Even this may be too many things but we will see how the discussion goes.